UK online sales reached £133bn last year according to latest figures. This huge total is up £18bn on the previous year, with mobile sales accounting for much of this growth. A staggering £25bn was spent online in the run up to Christmas alone, between 14th November and Christmas Eve. Many of the UK’s small and medium sized companies have so far missed out on online spending previous years due to their lack of web presence. According to the Department of Business, Innovation & Skills, more than half of customers (55%) say they find it hard to support local businesses when they simply can’t find them online. As a result, Nettl are offering web development grants to 100 SMEs to help them get online. 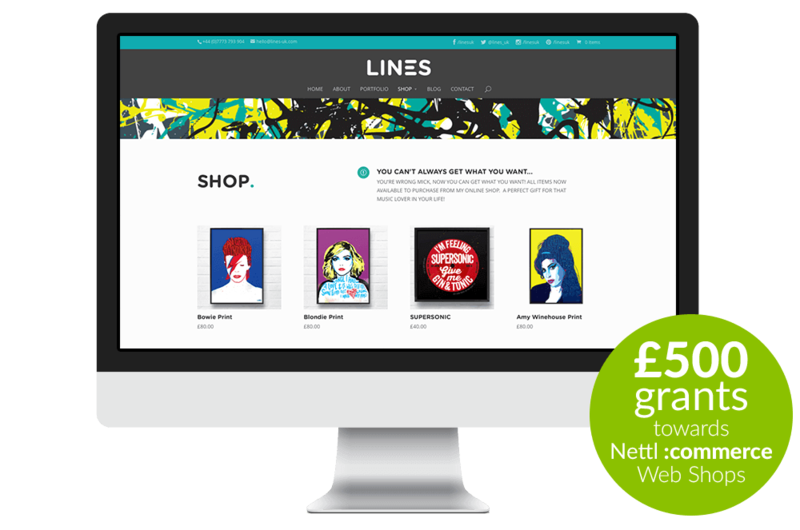 Participating studios in towns and cities across the UK are supporting small businesses by offering a free one-hour consultation and a £500* grant towards a Nettl:Commerce web shop. For maximum flexibility, we could build a totally custom ecommerce site for you. Some of our sister brands run multi-million pound online businesses with sites we’ve built from scratch. However, this is the most expensive route. The alternative – chosen by lots of businesses – is to start from an existing ecommerce platform, customise it and extend it. That’s a proven path and will get you trading online in a fraction of the time, for a fraction of the cost. • Website grant can only be used against a Nettl :commerce web shop or site using an e-commerce element. • Maximum amount that can be attained is £500 (€600 in Ireland). • Maximum 1 website grant per customer. • Studio Manager’s decision is final. • Website grant offering may be withdrawn at any time without notice.